One of the most commonly used colors in a wedding is pink. 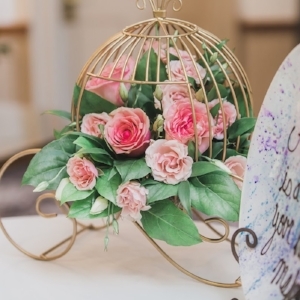 From pink roses to tulips, there is a vast array of pink flowers to choose from for your special day. When you think of pink, you think of unconditional love. It is a softer, more understated version of red, making it more gentle. Pink itself shows that you and your significant other are loving, generous, and sensitive. Since pink is an understated version of red, it brings warm and comforting feelings, perfect for your wedding day. You can certainly change the mood of your wedding by going for either a soft pink or a brighter pink. 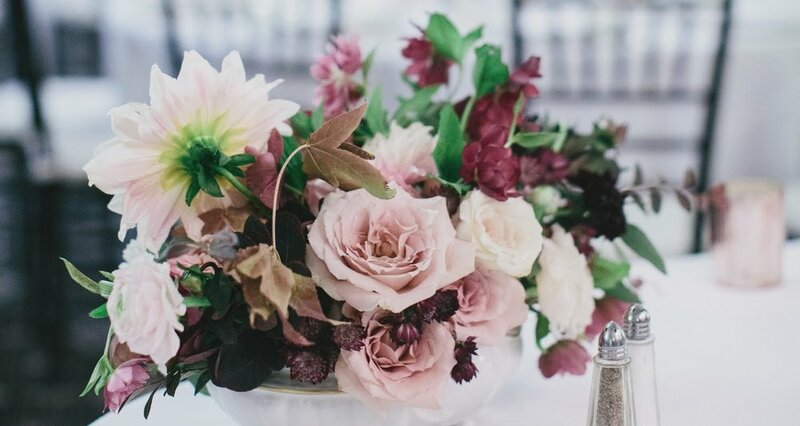 If you want your guests to feel comforted but feel the romance in the air, opt for a softer pink. If you want to let your friends and family know how passionate you are about each other, but still bring the sensitive and comforting aspect, choose a brighter pink! If you are thinking about having a fall wedding, you may consider having a color scheme that reflects the colors of the season. Sunflowers, daisies, and chrysanthemums are all examples of common flowers used for an autumnal wedding. Fall itself is a season that makes you think of coziness and warmth. You've just come out of the hottest time of the year and everything is beginning to cool down. What better time to celebrate love? Two of the most common fall colors are orange and yellow. Orange is said to be an uplifting, optimistic, and positive color that will bring warmth and happiness into your life. It has an inviting and social aspect to it that will have everyone in a friendly and social mood. Yellow is also an uplifting color that will be sure to put everyone in a cheerful, happy mood. These two colors will definitely have everyone in high spirits and will look great to highlight your special day. Want to go for something more traditional? 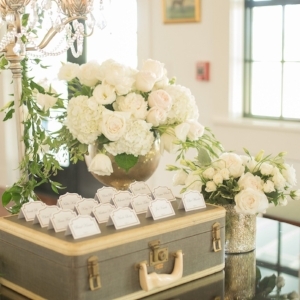 Consider having white or ivory flowers! From white roses, gardenias, and white tulips, there is a wide array of flowers to choose from. White in it's most basic form is said to represent innocence and perfection. It shows peace and comfort to those around it. Ivory, a warmer version of white, is considered more old fashioned. It is calming, yet encouraging. A traditional wedding dress is considered to be either white or ivory to represent the innocence that comes with being a bride. Considering something a little more bright for your wedding, but not something too overpowering? Salmon and peachy colors are the perfect option! Not only do they offer pops of color here and there, it also is perfect for those who want something a little different. Looking for something a little more sultry when planning your wedding? Wines are the perfect option! If you have a wedding on the brink between fall and winter, this color scheme will be sure to wow your friends and family. 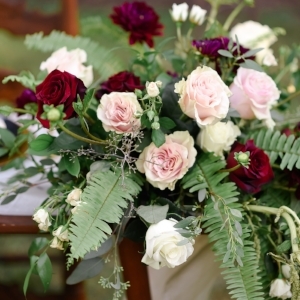 The darker tones represent power and can symbolize the strength that your marriage will have. Burgundy in particular is said to mean controlled passion and energy. Other words to describe burgundy include powerful, explosive, and strong. Another color similar to burgundy is maroon. Maroon is also a passionate color that also brings "thoughtful action." Said to be intense, it also brings confidence and creative thoughts. 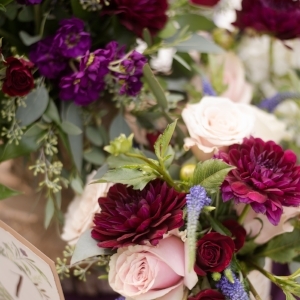 A rich purple, such as a plum is a sophisticated color that represents royalty and romance. Often popular with weddings, it pairs well with grays. 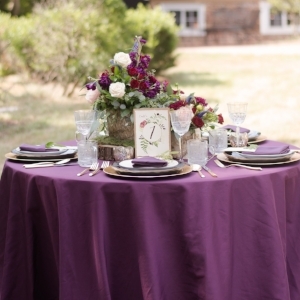 Brighter colors can definitely liven up a wedding. From reds, to yellows, to maybe even a pop of greens and blues, bright colors will let your guests know that you are ready for a fun time. This vivid colors mean you will have a vivid, exciting life. These colors also mean that you are an extrovert and love to socialize. It is your special day of course, why not be a social butterfly and be the life of the party! If you're looking to pair a bright color with something a little more tame, you could opt for a more classic, holiday-esque scheme with a bright red and a white. 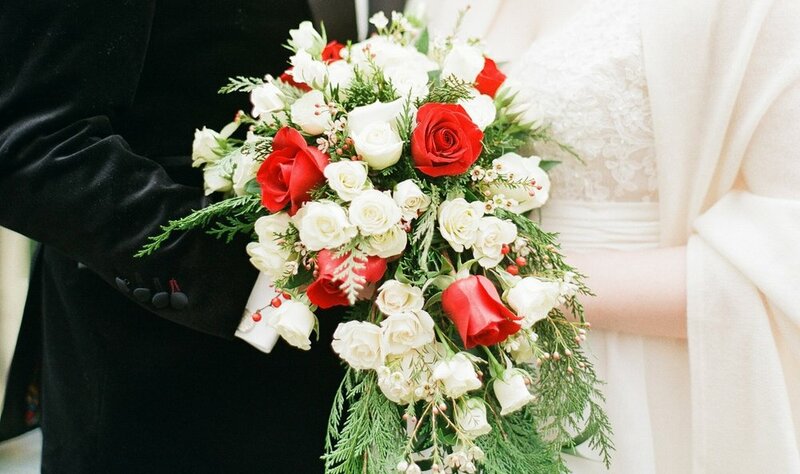 Red is a classic color of love and will bring vivacity and passion to your wedding. The white will certainly soften the tone and bring the innocence and purity aspect back into play. But together, you can't go wrong with such a classic, timeless pairing. 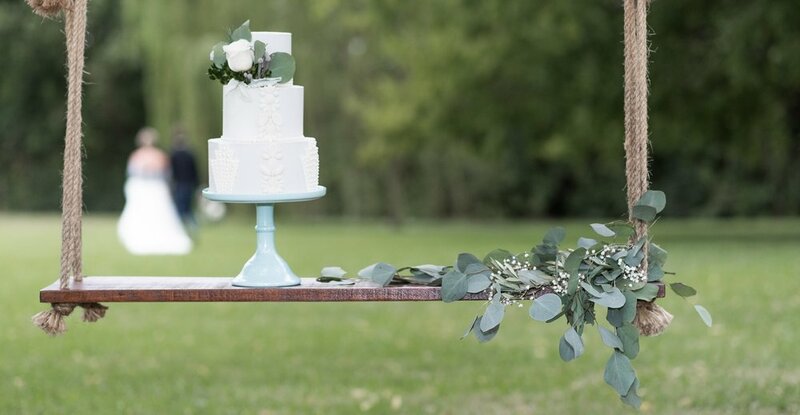 A new trend that we are loving, is having a lot of greenery in your wedding. Some examples include palms. lamb's ear, eucalyptus, and dusty miller. These green touches represent a calming and restful mood. These softer shades of green are common nowadays and look beautiful paired with lighting design. The color also represents unity and show that the person (or couple in this instance) tend to be nurturing and compassionate. I hope this post has brought you some insight and inspiration for your upcoming wedding. There are endless possibilities on how to color and design your special day. Special thanks to Empowered By Color for their information on color psychology. Sign up with your email address to get our newsletter which features insider content!